Mary Courtney Kelleher, age 51, died peacefully at Beechwood Nursing Home in New London, Connecticut on February 10, 2018. Courtney was born in Norwich, Connecticut on April 21, 1966, the youngest child of the late James H. Kelleher, MD and the late Mary Eileen Duffy Kelleher. Courtney was a graduate of Norwich Free Academy. She worked under Easter Seals supervision at Goodwill Industries and retired after twenty years. A lifetime participant in Special Olympics, she won numerous medals for swimming and bowling and represented her community as an Ambassador for the Special Olympics World Games. Often representing her peers, she met various dignitaries including former Governors Grasso and Weicker and current Governor Malloy who invited her to the Connecticut Governor’s Inaugural Ball. 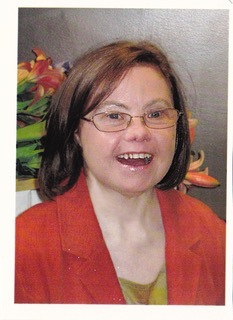 Courtney was an active, lifetime member of the Arc, an association serving people with intellectual and developmental disabilities. The Arc provided her with countless hours of recreation and great pleasure. In 2016, her fellow members chose her Prom Queen and she represented her peers on the Board of the Arc of New London County. Her own mother, Eileen, was a tireless advocate for her and others with similar challenges. Courtney’s life brought her family enormous joy and solidarity. Until her final decline, she could always be counted on for a ready smile, a fun loving, happy disposition, and an unmatched enthusiasm for the numerous family visits, gatherings or parties while never tiring of meeting and greeting new and old friends. She leaves her five siblings: Sara Ann Klemmer (Rick) of Sherborn, Mass., Jane Sobolov (Howard) of Goffstown, N.H., Colleen (Tim) Halloran of Cummaquid, Mass, Kathleen (Frederic) Belinga of Columbia, SC and Michael F. Kelleher (Carol) of Chevy Chase, Md. as well as thirteen nieces and nephews, three great nieces and a great nephew. She was predeceased by a cherished aunt, Jean Ann Duffy. The family wishes to recognize Vitas Hospice for their kindness and skilled care provided in Courtney’s final months as well as to thank the staff at Beechwood Nursing Home. The family’s deepest gratitude goes to the staff and residents of Hillcrest Group Home in Groton, Connecticut for their faithful, compassionate care and companionship during the 23 years she resided with them. They were truly her second family. A mass of Christian burial will be celebrated on Friday February 16, 2018 at St. Patrick’s Cathedral in Norwich at 10am. Burial will follow the service at St. Mary and St. Joseph Cemetery at 815 Boswell Avenue, Norwich. Funeral arrangements are being handled by Cummings-Gagne Funeral Home.